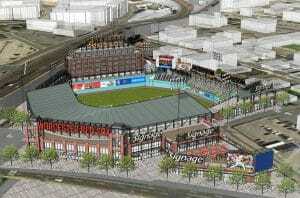 BOSTON, MA March 28, 2019 – Gilbane-Hunt, a Joint Venture, has been named construction manager for the Canal District Ballpark, new home of the Red Sox Triple-A affiliate in Worcester, Massachusetts. This multi-purpose, publicly owned Triple-A ballpark, located in Worcester’s Canal District, will accommodate approximately 10,000 fans upon completion in 2021. Gilbane provides a full slate of construction and facilities-related services – from pre-construction planning and integrated consulting capabilities to comprehensive construction management, general contracting, design-build and facility management services – for clients across various markets. Founded in 1873 and still a privately held, family-owned company, Gilbane has 48 office locations worldwide. For more information, visit www.gilbaneco.com. Gilbane has served as a leading construction manager in Massachusetts since 1946 serving private and public clients throughout the Commonwealth including PTC, Reebok, Wentworth Institute of Technology, Babson College, Google, and Northeastern University to name a few. For more information, visit Gilbane’s website at www.gilbaneco.com/boston.